Where do I use my Beauty Works voucher code? Click on the Code of your choice using the NetVoucherCodes site. Follow the link to the Beauty Work main site and browse for your goods. Click ‘Add to Bag’ when you find any items you wish to purchase. Follow the instructions in the final stages of your transaction. With over 7 years of supplying quality hair extensions, they offer our award-winning hair to some of the most prestigious salons and backstage stylists. 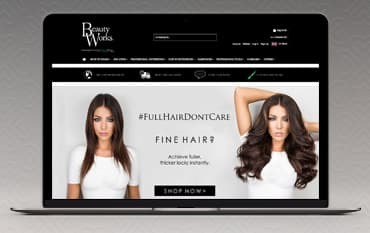 Beauty Works extensions have also been worn and championed by celebrities such as Michelle Keegan, Dannii Minogue, Nicole Scherzinger, Olivia Palermo and Victoria’s Secret models. In the Hair Extensions Sale at Beauty Works, you'll find a variety hair extensions and hair pieces with great discounts. Browse the sale category and find 'clip in' hair accessories like buns, bows, fringes and bun shapers, you can also find weft hair extensions, pre-bonded extensions, headbands, hairpieces and ponytails including synthetic and Remy human hair pieces. In the Sale, you'll find up to 50% discount across all hair products which are available in a range of colours, shades and lengths. At Netvouchercodes we have hundreds of voucher codes to help you save money on your online shopping. When shopping for hair extensions and hair accessories at Beauty Works why not check out our discount codes and grab a bargain. Simply browse our Beauty Works deals page and choose from all the biggest discounts and latest promotions available including sales, offers and deals. Just add your Discount Code for Beauty Works at the checkout or browse the checkout on the Beauty Works website and save big money on your order! Jen Atkin is one of the most in-demand celebrity hairstylists in the world with clients including Kim, Khloe, and Kourtney Kardashian, Katy Perry, Jessica Alba, and Jennifer Lopez. Her exclusive designs with Beauty Works include fast and easy hair solutions to use at home as well as salon professional extensions. You can find great hair products in the Jen Atkin range including the Invisi-Tape, Invisi-Clip-In, Invisi-Weft and the Jen Atkin Hair Enhancer. Browse from a range of hair colours and shades in the collection and find your ideal hair products from Jen Atkin. Find out more delivery costs and information on the Delivery Page. If you wish to return or exchange an item with Beauty Works, you must do so within 14 days of receipt. Before returning, you will need to request a return form from the Customer Services team. This can be done via email. You will be responsible for the cost of return. Beauty Works specialise in a wide range of clip-in hair extensions so you can update your look in a jiffy. With one of our Beauty Works Coupon Codes you can make great savings on hair extensions, clip-in extensions, hairpieces, hair care and much more. Whether you're after pre-bonded extensions, a clip-in ponytail, volume boost, human hair extensions or synthetic hair extensions, Beauty Works will spoil you rotten for choice.